Audit refers to an inspection of an organization’s processes, financials, information systems or compliance. Audits are conducted to check whether there are any malpractices going on or whether a company is complying with the industry standard practices. Integrated audit – an all-encompassing inspection of an organization’s operations, accounts, systems, and compliance. Internal audit notice – a department or division must be notified that an internal audit shall be conducted in the near future. The dates of the audit, the audit team and the objectives of the audit must be clearly conveyed. The department or division is bound to cooperate with the auditors. External audit notification letter – again if the company is required to conduct an external audit, a regulatory authority or a funding institution may send a notification letter to inform that the report of external auditors is due. 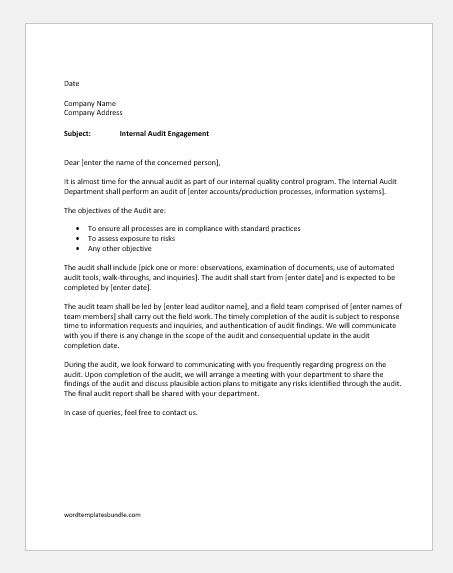 Internal audit engagement letter – An internal audit engagement letter is sent by an auditor to a client company highlighting the roles and responsibilities of the auditing firm. This is a communication in the initial stages of an agreement between a company and an auditor. 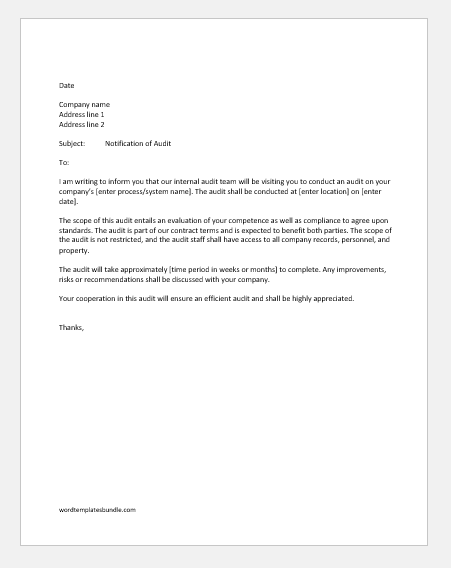 Supplier audit notification letter – this notice is served to a supplier to notify them of an inspection in order to ensure that the supplier is complying with the terms of the agreement. This is to inform you that an Internal Audit has been planned to be conducted from [enter date]. 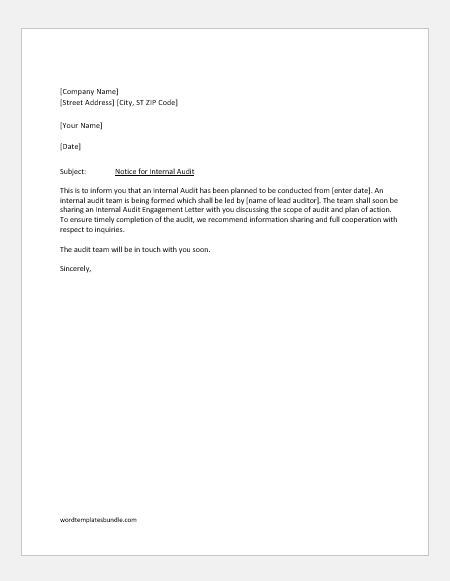 An internal audit team is being formed which shall be led by [name of lead auditor]. The team shall soon be sharing an Internal Audit Engagement Letter with you discussing the scope of audit and plan of action. To ensure timely completion of the audit, we recommend information sharing and full cooperation with respect to inquiries. The audit team will be in touch with you soon. I am hereby informing you that according to the [name of regulatory authority/funding organization/commission], a [financial/operational/integrated] audit will be conducted on your company. The audit shall be carried out in accordance with the contractual terms. For a smooth and efficient completion of the audit, please ensure that the audit team has unrestricted access to all company assets, employees, and documents including those in electronic formats. Mr. [audit team lead] will contact you soon, informing you about the start of the audit, expected time to complete and scope of the audit. As per the initial planning, the audit is expected to start from [enter date] and is intended to be completed by [enter end date]. The progress of the field work shall be shared with you periodically. Please share the name and contact details of the contact person who will facilitate the audit on your behalf. For the timely completion of the audit, please ensure that the audit team has unrestricted access to the company personnel, property and documents. The findings of the audit will be shared with the [regulatory authority/funding organization/commission] and your organization. The audit team will help you identify potential risks, give suggestions on how to improve processes based on the audit findings and suggest adjustments in the funding or contract terms. Any strong adjustments found in favor of the [regulatory authority/funding organization/commission] may lead to further inquiry and liquidated damages. You may contact the audit team lead if you have any questions. It is almost time for the annual audit as part of our internal quality control program. The Internal Audit Department shall perform an audit of [enter accounts/production processes, information systems]. The audit shall include [pick one or more: observations, examination of documents, use of automated audit tools, walk-throughs, and inquiries]. The audit shall start from [enter date] and is expected to be completed by [enter date]. The audit team shall be led by [enter lead auditor name], and a field team comprised of [enter names of team members] shall carry out the field work. The timely completion of the audit is subject to response time to information requests and inquiries, and authentication of audit findings. We will communicate with you if there is any change in the scope of the audit and consequential update in the audit completion date. During the audit, we look forward to communicating with you frequently regarding progress on the audit. Upon completion of the audit, we will arrange a meeting with your department to share the findings of the audit and discuss plausible action plans to mitigate any risks identified through the audit. The final audit report shall be shared with your department. In case of queries, feel free to contact us. 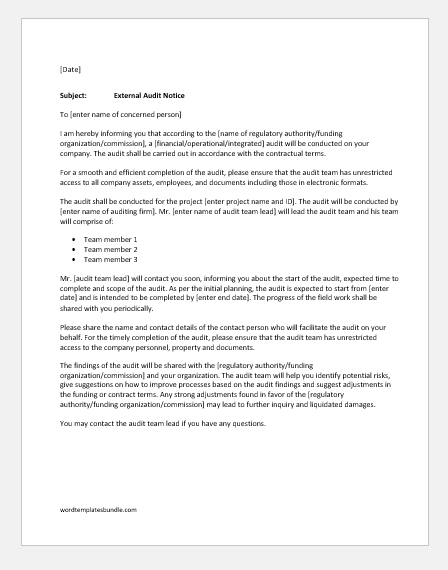 I am writing to inform you that our internal audit team will be visiting you to conduct an audit on your company’s [enter process/system name]. The audit shall be conducted at [enter location] on [enter date]. The scope of this audit entails an evaluation of your competence as well as compliance to agree upon standards. The audit is part of our contract terms and is expected to benefit both parties. The scope of the audit is not restricted and the audit staff shall have access to all company records, personnel, and property. The audit will take approximately [time period in weeks or months] to complete. Any improvements, risks or recommendations shall be discussed with your company. Your cooperation in this audit will ensure an efficient audit and shall be highly appreciated.